Hi, fellow adventurers! I thought it would be helpful if we began with some introductions (or re-introductions). I just read my posts from 2010- wow, time flies! I found them hilarious. They brought back some great memories. For those of you who don’t know me, I am 33 and the mom of two boys, ages 10 and 12. I’m a self-professed travel addict who loves randomness, nature, and tries not to take life too seriously. My day job is as a therapist (LPC, CADC) in a supportive-living facility on the Southside of Chicago. So glad to have you on board! Can’t wait to see all that 2016 has in store for us! Thanks for the reintroduction! I love what you did in 2015 and your plans for this year. ! I re-read my 2010 adventures recently, and it was a great way to reminisce and to get re-inspired. Except, it was a breezeless day. “Light” was how the MIT sailing pavilion volunteers referred to it. They and Brad all but assured me that the boat would do little more than slightly turn. Considering the list sequence of activities accomplished in 2010 it’s surprising that I’d approach sailing with such resistance. But resist I did, from as early as 8 a.m., when I picked up Brad and found myself in a foul mood – primed for drivers seat expletives and Starbucks bemoanings. I said that it was a bad morning and that I was irritable but someone Brad was able to coax the true concern out of me. 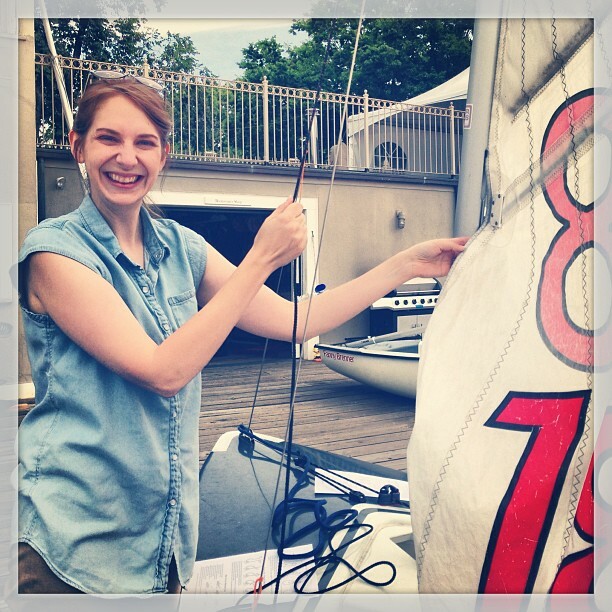 I was scared of sailing. But how? Why? Sailing seems so simple – so run with the wind free that it hardly bears fear. But that same reticence that accompanied sky diving, trapeze swinging, horseback riding, crept in. I was worried I would capsize. Or, worse yet, that I might fail to understand the fundamentals of boat manuevering and make a fool of myself – sitting static in water with a boon of proper sailors with bull horns announcing my defeat. Brad said that this was crazy. That is was a freakishly light day and that capsizing was all but impossible, given the weather conditions. He calmed me some. We started the class with little instruction and were asked to set up our boat. Thankfully Brad’s a skilled sailor and he talked me through the stunsail knot – the bow line set up – the rigging and checking. With his expertise I felt like a real deal. I stood cooly by my boat imploring the class instructor to let me take the wind. I thought it could really be as simple as moving forward. Not so fast, as we were subject to some warnings and ‘safety’ instructions. We were then led outside, subject to a minimalist demo and told to queue up to sail. At this point I thought (to myself) ‘ I have no idea what I’m doing but I’ll try ‘ . Then some anxious volunteer with no capacity to explain himself asked me to demonstrate tacking. I tried. He got irritated and corrected me. His corrections were nothing but a jumble and I tried again. His irritation doubled and he spouted some quick, incoherent directives that I couldn’t understand. I tried again only to meet the same fate. Just as he was about to go down the same rabbit hole I gave up and switched seats with Brad. I said I wouldn’t skipper – that I felt stupid. Brad, trying to make the best of the situation took the helm (?) and we pushed off to sea. Well to the Charles River. Brad demonstrated turns and manuevers. It was fun having him in control. We sailed like we’d been doing it all our lives and I really felt one with the water. When we again docked it was my turn to skipper the vessel. I felt good about this go. I took the tiller and steered us in the direction of a bright orange buoy. I turned and switched seats as instructed, but no sooner than I did that did the wind carry and the boat feel like it would soon capsize. The rush of wind – the power of a hand polished vessel fighting resistance – took hold and I panicked. I dropped the tiller. I dropped the sail. I started to scream, “Brad fix it! I can’t do this!” only to have Brad completely assume control. This is embarrassing – to type and to relive. We were in no imminent danger. The worst thing that could come of that situation would have been us veering off course, but it felt like a personal failure. I sucked at sailing, and because of this, I had NO INTEREST in follow up laps. We were given opportunity to skipper again and again but each time I declined. And with each decline some volunteer, or the instructor, or the instructor’s assistant would ask why. The incoherent man mentioned earlier bothered me further but asking me to again assess my failures. It seemed so simple! Everyone seemed to be getting it! I can not say what was wrong with me except that all the attention and all the misadventures left me little choice but to cry. It was a sunny day and I wore sunglasses so few knew, but still the association stung. I felt like I’d ruined sailing. Everything that seemed so free and wild and exciting about it was now permanently imprinted in my mind as a chaotic springboard to crying. I was relieved when we were called in for further class work. Time has past but this site is just as welcoming as when I left it last. In all honesty, it’s hard to come back here. To be reminded of the risks and recklessness that permanently imprint all of 2010 in my memory. Because I want that again. I want to feel alive and adventure-full and interesting and capable. I want to run screaming from my desk job and pick up an axe and work as a lumberjack. Or swim with the dolphins in some exotic locale. I never did milk that spider or join in on a wine crush. So it’s painful, being reminded of what was – seeing that 2010 was too many years ago and that the momentum died. Well it’s all great and good to get nostalgic, but I’m going to spare you further complaints. This stems – the site visit, the thinking, the brooding – from a deep seeded restlessness. My husband has been away on business in a foreign locale. He’s waist high in work but I can’t help but envy the adventure potential. He’s living abroad! He can try new foods and see the world from new angles! And even while he’s pulling all nighters and begging, imploring really, to come home, I want only to join him and soak up some other sun. That helps with sleeping – dreaming of another life, thinking of all that could be if I would just get up and be it – but in the end I’m awake more than I am asleep and if I want to make beautiful my everyday I should do just that. First, the list. I’ve done this before and I’ve no shame in constantly amending and revising and striking through all the things I’d one day like to do. I don’t think bucket lists are for the birds. Or, if they are, I think they are for the colourful quirky toucans, or the high soaring hawks. They are for the birds that make a mark in the animal kingdom and I’d love nothing more than to have their wingspan. So I put together a bucket list – initially of things I once wanted – a carbon copy of lists of old. This got tedious because I kept striking through so much of the list sequence. I’d see that I wanted to trapeze swing, only to cross it off the list because I’d been there, done that. Well that gave me pause. And pride. I’d done so much! For the life that I was leading in comparison to the life I now live I’ve collected experiences and anecdotes and smiles and sobs at an inordinate pace. Thank-you for this update. You’ve inspired me too. It’s so easy to get bogged down in the dailyness of life. We can have adventures by making them a priority and making it happen! Thanks! Ok, Week One – Pierce my nose in Edinburgh (and scout out places for the “Establishment”). I think Im going to video this for gore’s sake. Take pictures! I’m getting an adventure nose piercing but not for many months. I’ve got to work into it. This just in: I’ve set up a link on this page for Flickr. As well as on Twitter. The silly twitter name is 52Adventures, as is the Flickr username. Once the year starts I’ll create a flickr account where we can upload our adventure shots!